Research background: We assume that the dynamics of spatial wage inequality can be caused by both shifts in the sectoral structures of regional economies and changes in inter-sectoral and intra-sectoral (inter-regional) wage inequality. Purpose of the article: The paper is aimed at analysis of the sectoral factors influenced the spatial wage inequality in Russia in 2005-2014. 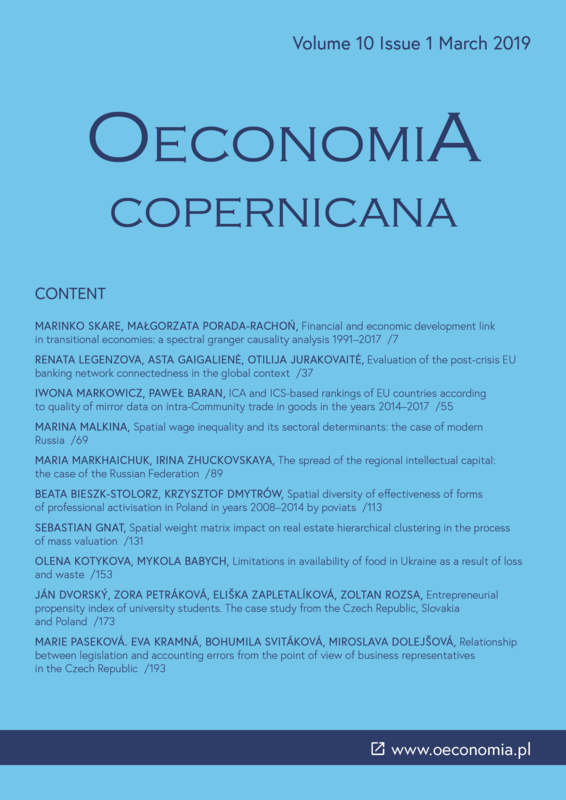 Methods: The employment-weighted Gini coefficient was applied for assessment of spatial wage inequality; the modified Lerman-Yitzhaki technique allowed to decompose it by main economic activities and their determinants; the mixed methods of factor analysis was used to evaluate the contribution of sectoral determinants to regional wage convergence in Russia. Findings & Value added: We found a weak and inconsistent convergence of Russian regions in average wage over the period under review and explained it by the opposing forces in the main economic activities. The spatial convergence was basically created by mining, manufacturing, agriculture, construction, and transport and communications activities, while wholesale and retail trade, financial intermediation and real estate operations counteracted it. The convergence was mainly facilitated by a reduction in inter-sectoral differences in wages as well as by rapprochement of the employment structures in some economic activities of Russian regions. In the meanwhile, the migration of labor force from lower wage to higher wage activities negatively affected the smoothing regional differences. Ultimately, intra-sectoral wage inequality and wages correlation in various activities rather preserved inequality. The results are applicable in the management of spatial inequality both at the regional and national levels. Behr, A., & Pötter, U. (2010). What determines wage differentials across the EU? Journal of Economic Inequality, 8(1). doi: 10.1007/s10888-008-9106-z. Bracalente, B., & Perugini, C. (2010). The components of regional disparities in Europe. Annals of Regional Science, 44. doi: 10.1007/s00168-008-0276-1. Castellano, R., Musella, G., & Punzo, G. (2018). Exploring changes in the employment structure and wage inequality in Western Europe using the unconditional quantile regression. Empirica. doi: 10.1007/s10663-017-9397-z. Friberg, K. (2007). Intersectoral wage linkages: the case of Sweden. Empirical Economics, 32. doi: 10.1007/s00181-006-0077-2. Gimpelson, V. Ye. (2016). Structural change and inter-industry wage differentiation. Journal of the New Economic Association, 3 (31). Ivanova, V. (2018). Spatial convergence of real wages in Russian Cities. Annals of Regional Science, 61(1). doi: 10.1007/s00168-017-0855-0. Kuznets, S. (1955). Economic growth and income inequality. American Economic Review, XLV(1). Lerman, R. I., & Yitzhaki, S. (1984). A note on the calculation and interpretation of the Gini index. Economics Letters, 15(3–4). doi: 10.1016/0165-1765(84)90126-5. Malkina, M. (2017). Contribution of various income sources to interregional inequality of the per capita income in the Russian Federation. Equilibrium. Quarterly Journal of Economics and Economic Policy, 12(3). doi: 10.24136/eq.v12i3.21. Milanovic, B., & Yitzhaki, S. (2002). Decomposing world income distribution: does the world have a middle class? Review of Income and Wealth, 2(48). doi: 10.1596/1813-9450-2562. Miyake, A., Muro, K., Nakamura, T., & Yasuoka, M. (2009). Between- and within-group wage inequalities, and the advent of new technology. Journal of Economic Inequality, 7(4). doi: 10.1007/s10888-008-9091-2. Monastiriotis, V. (2000). Inter- and intra-regional wage inequalities in the UK: sources and evolution. ERSA conference papers ersa00p228, European Regional Science Association. Oda, M., & Stapp, R. (2009). Factor mobility and wage inequality. In T. Kamihigashi & L. Zhao (Eds.). International trade and economic dynamics. Berlin, Heidelberg: Springer. doi: 10.1007/978-3-540-78676-4_8. Oshchepkov, A. (2015). Compensating wage differentials across Russian regions. In C. Mussida & F. Pastore (Eds.). Geographical labor market imbalances. AIEL Series in Labour Economics. Berlin, Heidelberg: Springer. doi: 10.1007/978-3-642-55203-8_4. Paredes, D. (2012). Alternative theories for explaining the spatial wage inequality: a multilevel competition among human capital, NEG and amenities. Serie de Documentos de Trabajo en Economía - UCN, WP2012-06. Retrieved from: https://socionet.ru/publication.xml?h=repec:cat:dtecon:dt201206 (03.11.2018). Senftleben-König, C., & Wielandt, H. (2014). Spatial wage inequality and technological change. SFB 649 Discussion Paper 2014-038. Retrieved from: http://sfb649.wiwi.hu-berlin.de/papers/pdf/SFB649DP2014-038.pdf (03.11.2018).